Dress comfortably and in style with these Twisted X Driving moccasins. This style features a high top design with laces. This all leather style will be sure to please as you go about your day. 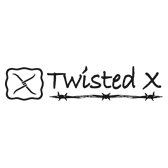 Twisted X uses distressed leather to make sure you are wearing only the best.